If you love horses or know someone who does, there are plenty of horse craft projects to keep you busy. Whether you like to cross stitch, enjoy doing paper crafts, or are simply looking for a children's activity, here are some ideas you will love. There are numerous horse-related patterns for cross stitching for beginners and experts alike. These can be used on quilt squares, jackets, and even book covers to make a unique gift. You can use these patterns to create cross stitch cards, bookmarks, or whatever you wish. If you own a horse, you can upload an image to a photo charting service, Elite Designs, and have a unique, personalized cross stitch chart done for you. Appliqué provides numerous opportunities to create horse-themed craftsl. You can add appliqué images to jackets and sweatshirts for your favorite horse lover. An appliquéd pillow or quilt makes a great gift as well. 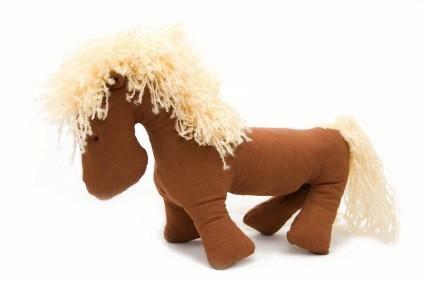 There are hundreds of ways to use a horse theme when knitting or crocheting. Purses, sweaters, and afghans are only a few of the possibilities. Whether you are a teacher, doing a homeschool unit study, or are a frazzled mom on a rainy day, here are some easy horse craft projects that your kids will love. Remember to read through the project to ensure that it is age appropriate. If you are working with many small children, you should have one older child or adult for every two or three children, depending on the complexity of the project. Keeping basic materials on hand makes it easy for your children to create whenever the mood strikes them. A special storage tub or cupboard dedicated to craft supplies is perfect. Your children can easily make sock puppets with a horse theme. Just provide yarn in a variety of colors for the mane and buttons for eyes. Strips of fabric can be glued on for a bridle or left off completely. Allow kids to use found materials to add character and personality to their puppets. Use cardboard boxes, construction paper, and plastic horses to create a diorama. Just add small twigs, pebbles, and other items to make it look real. Larger cardboard boxes can be colored and made to look like a real barn for playhouse fun. You can make a horse lacing craft by cutting a simple horse shape from a piece of poster board. You can use a large cookie cutter for this shape if you wish. Have the shape laminated and then punch holes around the edges. Small children can use yarn and utilize fine motor skills by "sewing" around the edges. Horse craft projects are fun for horse lovers of all ages.